And although I laughed at it, appreciating Stephen’s wit in revealing truth, there was definitely an element of wistful longing in there, too. That I can’t join in the NaNo fun; that November is always just so gosh-darn-ludicrous that even finding 15 minutes to write per day is tricky, and happens far less often than I’m happy with. But I wonder if I *would*, if I actually were given the time and the headspace to do it. 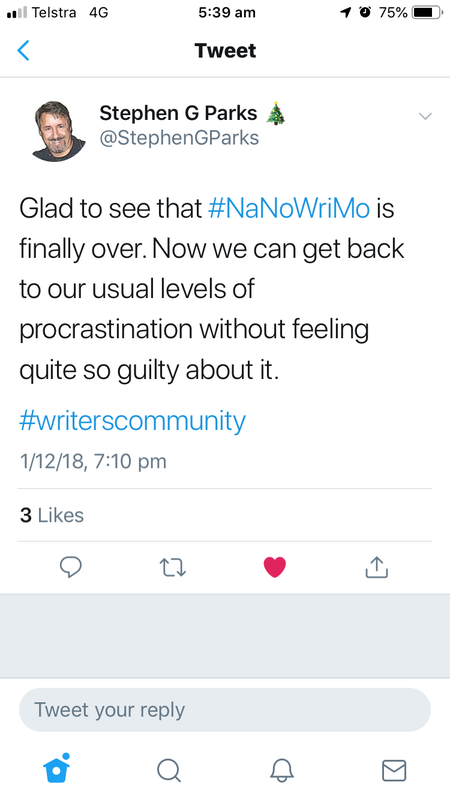 NaNoWriMo, or NaNo for short, is a month-long writing challenge, to write a novel – 50,000 words – in the month of November. 30 days. 1,666 (ish) words per day. Can’t do that in 15 minutes. The title stands for ‘National Novel Writing Month’ because it was started by some San Francisco Bay writers in July of 1999, who set out to each write a 50,000 word novel by August 1st. They did it, then decided to invite others to join them. 19 years later, and it’s now an international event – which I can’t join. Not yet, at least. Not with my current level of organisational ability. I wonder if next year, it would be an impossibility too? Because that’d be cool: to join them in their 20th year of NaNo-ing!